The direct method for German is divided into 8 stages. If you choose our intensive course (twice a week) one stage will last for about 3 months. After Stage 4 we recommend our students to participate in the exam “A2 Grundstufe Deutsch 2 (GD 2)”. This exam is for learners whose knowledge of German is sufficient to deal with situations in private and professional contexts at a higher elementary level. A2 Grundstufe Deutsch / GD 2 is accepted as proof of sufficient language competence to apply for Austrian citizenship and permanent residence in Austria. After Stage 6 we recommend our students to participate in the exam “B1 Zertifikat Deutsch (ZD)“. This exam is for learners who can already deal with everyday situations without difficulty, also when travelling as tourists or when talking about their own interests and areas of specialization. The emphasis is on communicative competence but attention is also paid to formal accuracy. “Zertifikat Deutsch” was developed by the ÖSD in cooperation with the Goethe-Institut, telc GmbH and the Centre for Language Learning and Research at the University of Fribourg in Switzerland. “Zertifikat Deutsch” is accepted as proof of sufficient language competence to apply for German citizenship. 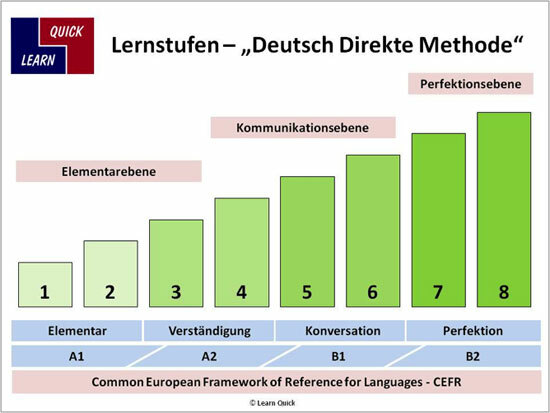 With Stage 7 and 8 of the “Deutsch – Direkte Methode“ we start already with the preparation for the exam “B2 Mittelstufe Deutsch“ This level exam is for learners who are able to communicate clearly and in detail on a broad range of topics and who can conduct a normal conversation with native speakers spontaneously and fluently. The “B2 Mittelstufe Deutsch” Diploma is accepted by some Austrian, German and Swiss universities as proof of German language skills as required for university entrance. Here you will find information about our course times and prices.